Limerick, Cork City and UCD all have players in our best XI from last weekend’s games. Limerick Sam Oji and Pat's striker Christy Fagan. Barry Ryan (Limerick) – Was handed a late call-up when Shane Cusack pulled up injured in the warm-up but performed admirably and kept Limerick in the game with a couple of top class saves. Roddy Collins (Derry City) – The young right back excelled on Friday night, keeping both Cathal Brady and Carl Walshe quiet and also attacked with real purpose when required. Andy Boyle (Dundalk) – Along with team-mate Brian Gartland, the Lilywhites defender kept Sligo and Danny North very quiet. Sam Oji (Limerick) – A superb display from the big centre-half who is fast becoming one of the most highly-rated defenders in the league. Simon Madden (Shamrock Rovers) – Madden’s attacking contribution earned him rave reviews from manager Trevor Croly who compared him afterwards to Dani Alves. Played a crucial role in two of Rovers’ goals with dangerous deliveries. Brian Lenihan (Cork City) – The full-back is developing into a solid defender and produced another assured performance at Turner’s Cross. Ayman Ben Mohamad (UCD) – Lively on the left and his goal was special. He was full of energy and caused problems every time he was on the ball. Garry Buckley (Cork City) – Capped a fine performance with the Rebels’ third goal — a half-volley from Colin Healy’s cross. 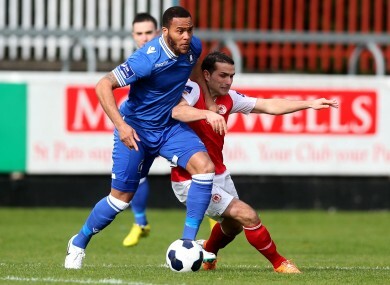 Craig Walsh (Bohemians) – Worked tirelessly, pressing Rovers as they tried to play the ball out from the back. Combined well with Stephen Beattie when Bohs were going forward. Man of the match for the home side. Michael Duffy (Derry City) – The winger showed some very neat touches on Derry’s left and was only denied a goal when his first half shot was tipped onto the crossbar. Christy Fagan (St Patrick’s Athletic) – Three goals from three league outings for the Saints striker with a cool finish after Chris Forrester’s lovely flick-on. Agree with the team? Tell us in the comments section below. Email “Here’s our SSE Airtricity League Premier Division Team of the Week”. Feedback on “Here’s our SSE Airtricity League Premier Division Team of the Week”.